Any questions about ACULA’s products or services? Please look for the answers as below. What is a video loop through? Monitors use a loop through function to display one scene on multiple monitors. This is helpful in a CCTV environment where many people may need to view the same scene. TV Lines are used to measure analog TV resolution. TV Lines indicate the maximum number of identifiable changes that can be produced along a single (horizontal) scanline. Much like film, where Visual Resolution is measured in Line Pairs, analog TVs measure the number of black and white (vertical) lines that can be seen on the screen at the same time. For example, PAL B/G has a 5MHz signal, meaning 5 Million waveforms per second. The Active Area of a PAL picture is 52µs, resulting in 260 complete waveforms (5,000,000 x .000052) or 520 TV Lines ((5,000,000 x .000052) x 2). ACULA’s CCTV Monitor uses a software technique that can reach up to 650TVLs. There are two kinds of resolutions: horizontal resolution and vertical resolution. In general, resolution refers to horizontal resolution. -Horizontal resolution: The maximum horizontal display line that can be identified by using a black and white pattern. -Vertical resolution: The maximum vertical display line that can be identified by using a black and white pattern. Why do compatibility issues arise when using different cameras and monitors? How is this prevented? There are various reasons why non-standard video signal compatibility issues exist. Although NTSC, PAL, and SECAM provide universal standards, compatibility issues can arise due to varying CCTV qualities and increasing transmission signals to avoid environmental attenuation. Because of these issues, the industry is accustomed to use Line-Lock technology when resolving flicker. ACULA takes all known compatibility issues into account during the design process. We design CCTV products that utilize automatic image adjustment processing, so customers view the best image quality possible. We also implement strict internal testing procedures. Because of the large number of camera types on the market, our design team works with clients to resolve quality and compatibility issues when they occur. What is passive loop through and active loop through? Passive loop through means the loop-back function works even when the monitor isn’t supplying power. Active loop though means that the monitor needs to supply power in order for the loop-back function to work. All ACULA CCTV monitors support passive loop through. The Point of Sale System, POS (also known as EPOS in Europe) is an electronic system widely used in the retailing, catering, and hotel industries. Its main function is to tally product sales, inventory, and customer purchasing behavior. This system effectively allows proprietors to improve management efficiency and is considered indispensable tool in the modern retail industry. However, due to the expanding POS applications, many manufacturers have changed Point of Sale to “Point of Service” (Service POS System). What are the POS related hardware facilities? Other than the computer software, the POS System normally features the following hardware facilities: mainframe computer, cash register, bar code scanner, paper/invoice printer, card machine, card/chip card reader, fingerprint sensor, programmable keyboard, customer display, touch screen, etc. In addition to other devices, such as PDA or other specialty hand devices used by the retailers for convenient management, they also have internet access to transmit information to corporate headquarters. What are the touch screen types? The current market share of resistive touch panels is about 80~90%. A resistive touch screen panel is composed of two conductive layers. When an object such as a finger, stylus, or a force presses down on a point on the panel’s surface the two layers become connected at that point the panel then behaves as connected outputs. This causes a change in the electrical current and after passing through the back-end IC, it is registered as a touch event. In short, any pressure applied will trigger a response. The current market share of surface capacitive touch screens is about 5~10%. A surface capacitive touch screen produces a uniform electric field on the touch panel surface. When it comes in contact with the human body, it causes a change in the electrical field, making the human body itself a conductor. By detecting the change in the electric field, the touch position can be determined. Therefore, a capacitive panel relies on a body or a conductive object to trigger a response. 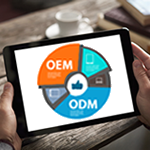 These types are rare in the general consumer market due to their application environment, demand, and cost considerations. What is a 2D/3D comb filter? In signal processing, a comb filter adds a delayed signal to itself, causing signal assembly and disassembly interference. The frequency response of a comb filter consists of a series of regularly spaced spikes, giving the appearance of a comb. 2D and 3D comb filters smooth the delayed signal, thus reducing interference. 2D and 3D comb filters are implemented in hardware (and occasionally software) for PAL and NTSC decoders. The filters work to reduce artifacts such as dot crawl. The 3D comb filter is the most recent filter to reduce signal delay and significantly reduce dot crawl. What is the difference between CCTV monitors and commercial monitors? CCTV monitors utilize a camera or digital signal source such as NTSC, PAL, or a similar color-coding system to record and transmit images. CCTV monitors are also equipped with VGA/DVI format signal input. 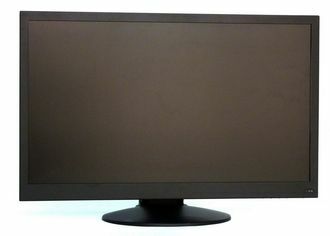 Traditionally, commercial monitors only provide VGA/DVI input format. Thus, CCTV monitors emphasize image-processed design, and yield a cleaner, sharper picture using 650TVL resolution. There is a noticeable increase in image brightness and sharpness when viewing images on a CCTV monitor. Because CCTV monitors are kept on continuously, they are designed with a 3-year lifespan. Commercial monitors have roughly a 1-year life span. In a typical CCTV Monitor, the interlaced display draws only half of the lines on the screen for each frame, alternately drawing the odd and even lines for each frame. This reduces flicker by taking advantage of the persistence of vision effect, producing a higher refresh rate. When displaying video on a display that can support a high enough refresh rate such that flicker isn’t perceivable, interlaced video can be de-interlaced for better viewing. All current displays (e.g., LCD) require de-interlacing. De-interlacing requires the display to buffer one or more fields and recombine them into a single frame. In theory this would be as simple as capturing one field and combining it with the next field to be received, producing a single frame. However, the originally recorded signal was produced as a series of fields, and any motion of the subjects during the short period between the fields is encoded into the display. When combined into a single frame, the slight differences between the two fields due to this motion results in a “combing” effect where alternate lines are slightly displaced from each other. Therefore, modern de-interlacing systems buffer several fields and use techniques like 3D de-interlacing to reducing the tearing effect. What is the difference between our Professional, Premium, and Standard CCTV monitors? Professional CCTV monitors support PIP, VOV, PAP, 3D comb filter, 3D de-interlace, and a resolution of up to 650TVL. Premium CCTV monitors support 3D comb filter, 3D de-interlace, and a resolution of up to 650TVL. Standard CCTV monitors support 2D comb filter, 2D de-interlace, and a resolution of up to 450TVL. Why do I need to buy a CCTV monitor? ACULA CCTV monitors are designed for continuous year round use and come with 2-year warranty. Our monitors have a better TVL resolution, crystal clear picture, and PAL/NTSC system support. The Acula monitors are – Built to Run 24 x 7 x 365 continuously. Our monitors are designed, engineered and manufactured with CCTV LCD solution for professional security surveillance.